For reasons of checking the accurancy of the Parker I simulated the 2006BQ6 orbit , with initial conditions as in the simulation of GravitySimultor . On the 2nd graph, I'm not quite sure what the data means. The circle in the middle is the orbit of the Moon? What does 1000AU 25 time 33249 mean? Sorry, I didn't understand your description. What is the time step you are taking? The data in the upper left corner seems to suggest it is 4 days, but the spacing between the dots on the graph seems to suggest something less than this. Am I interpreting the rest of the data correctly? : 16851 iterations. It took your computer 126 hours to do the simulation, 1 iteration every 4 days, the total simulated time is 88782 days, or 243 years.
. The circle in the middle is the orbit of the Moon? The circle in the middle is indeed the orbit of the moon . The time step in this simulation ( Parker method ) is calculated to obtain a certain accurancy . I set the accurancy in this case up to 10 meters . The program then calculates when it has to calculate the new conditions . The average simtime ( the period in which the expression remains valid is about 126 hours ) . After this time a new set of formulas is calculated in order to obtain an accurancy of 10 meters at THE END of the sim. This means that the total simulation is divided into a series of sims , each accurate up to 10 meters. The numbers in the plot mean : 1000AU 25 = 25*10-3 AU , and the time is the time elapsed in days since the start of the program ( start date = start date of the GravitySimulator ) . The intermediate dots represent the calculated path . In this case I told the program to plot 30 dots in each simulation set . The total CPU time for this total sim ( 250 years or so ) was about 20 minutes (not displayed here ). 12 bodies were involved , just as in the GravSim Simulation . Thanks for that. Sorry I haven't had much time to look at this method in detail. It looks promising. I'm on my vacation month now and I'm not home much. Next 2 weeks I'll be scuba diving. The close approach last year was really a chance ...in a million . Does QM111 endangers other planets as Venus or Mars , as it also crosses the orbits of this planets ? According to Nasa the Asteroid 2006XG1 is the highest ranked in the hazard scale today. The closest encounter is expected to be in 2041 ! As can be seen in the next simulation it stays at a safe distance from earth . Both simulations were run for 100 years , but with varying accurancy (10m and 100 m ) . Remarkable for the accurancy is the point at the right corner were the asteroid crosses at visually the same point . 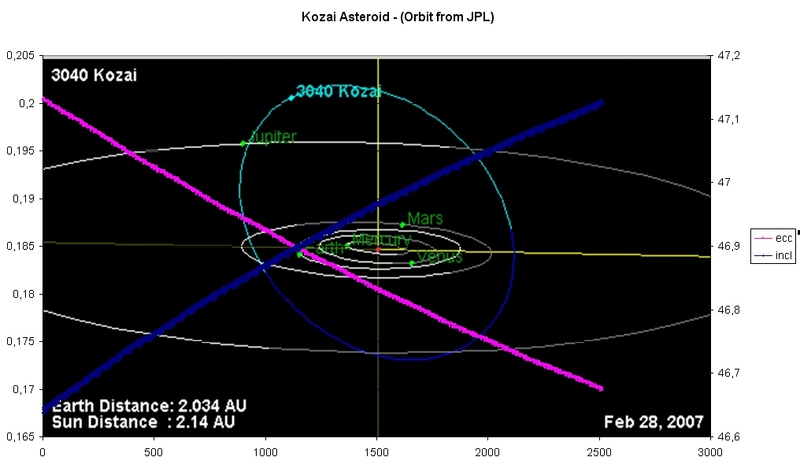 the asteroid 2004MN4 will come close according to Nasa in 2029 april 13th . In annex a simulation with the P-method , starting on 29/08/06. Initial data were taken from the Ephemerides site of Nasa. The screenshots shows the asteriod in the xy plane , centered on Earth . The circle in the middle is the orbit of our moon . As can be seen the ast will come close in a few years ( maybe the occasion to tag it ?) and in 2029 will shear the earth , within 28*10-5 AU . Data were taken from Apophis.gsim , processed by GravSim , outputted and processed by an 2D viewer . The picture shows Apophis approaching from the left under , swinging by Earth and approaching the Moon , going to the top of the picture on 13/04/2029. Apophis' diameter was magnified by ca. 1000 to make it visible . 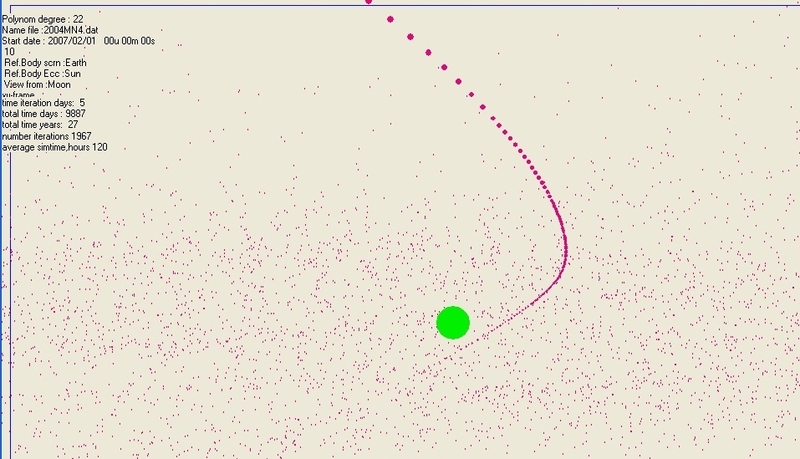 The small dots are Apophis , in orbit in previous years ( sim started in 2007) . 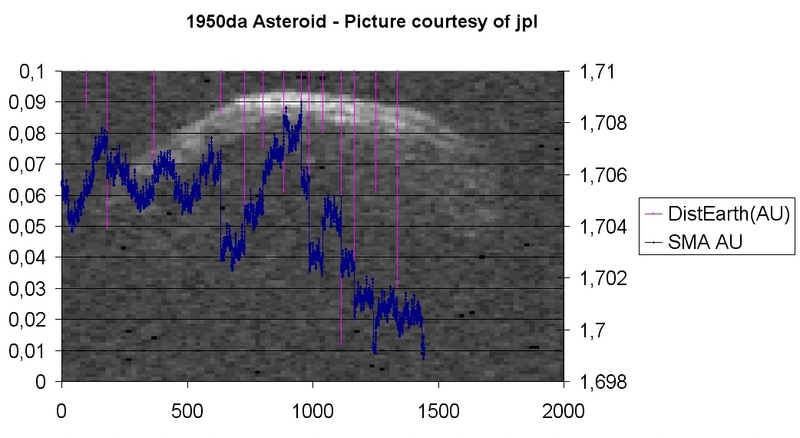 Here's another "oldie" , the asteroid 1950da , discovered in 1950 and rediscoverd in 2000. From this asteroid radar pictures were taken by Arecibo ... Hereunder the link to the jpl site . The odds for a hit were once 1/300 . This would happen in the March 2880.... A long time from now. The possibility for a near encounter before 2880 is nearly existent , that's why it is removed from the PHA - list . I ran GravitySim , with the initial conditions of jpl-ephemerides service on 01/02/2007 and ran it for about 1400 years . Screenshot hereunder shows the near approaches to earth ( red line ) . Remarkable is the variation of SMA of the asteroid ( blue line ) . The SMA of the asteroid seems to get a "shot" nearly everytime it comes close to earth , meaning that earth each times changes the orbit of 1950da by some amount . However , there is a serious dip in SMA around 650 from now ,although the astro doesn't come very close . Analysing the orbit of 1950da it seems however that it came close to Mars at that time . The year 2880 doesn't seem to be be a tread , as the astro stays at about 0.06 AU from Earth , due to subsequent changes in its orbit ? One of the biggest known near earth asteroids is 1999JM8 . It came close in 1999 and was observed by the Arecibo radio telescope ( radio images exist ) . It measures more than 3 km in diameter . Calculations show there is no thread within the next couple of houndred years .. Here's a link to the JPL -site depicting its orbit . However , the asteroid comes "close" to jupiter about 6 times every 100 years , but not closer then 1 AU . The gravity of Jupiter then tuggs on the asteroid . In the picture hereunder a screenshot of the exported data of GravSim , showing the distance to Jupiter and the SMA of the asteroid as a function of years ( starting 2007 ) It seems that Jupiter really alters the SMA of the asteroid at each close encounter . The same change exists in the inclination and the eccentricity of the asteroid . 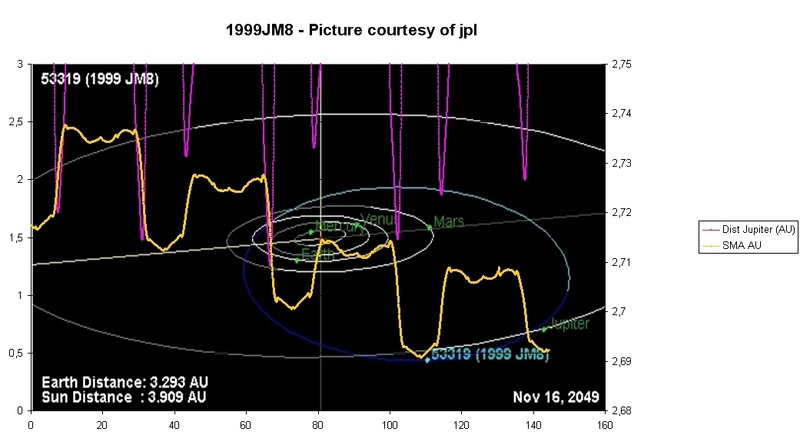 Superimposed on the graph is a screenshot of the link above , showing the orbit of 1999JM8. Herunder a screenshot of the simulation of the orbit , generated with Picard . The asteroid must be rather big ( I found 17 km on a polish site ) , is a Mars crosser and has an inclination of more than 40° . It does not come close to the Earth .